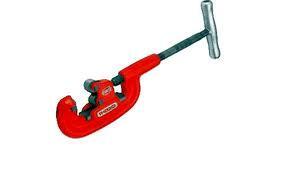 PIPE CUTTER - TO 2"
Ridgid heavy duty pipe cutters are the most reliable, tested cutters on the market. Rent one for your pipe cutting needs today! -Extra-long shank protects adjustment threads, while an extra-large handle is provided for quick, easy adjustment. -Second handle on 3-S, 4-S and 6-S models makes two-man leverage possible on large pipe sizes. * Please call us for any questions on our pipe cutter to 2 inch rentals in Kokomo IN, Logansport, and Central Indiana.